Paths should offer year round access to your growing areas as well as garden features like sheds. 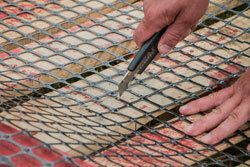 They needn’t be complicated or expensive, but should be well built for safety and durability. Grid for Garden Path and Parking is an inexpensive material for the construction of a garden path, sidewalk, private parking lot, driveway in front of a private garage or a playground. It is provided in the convenient format – 2 meters wide. It’s easy to be transported in a car and stored in a shed. 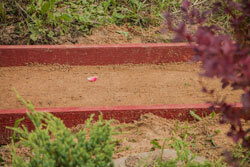 The decay of garden walkways and paths under natural conditions is the recurrent trouble in one’s private garden. Paving slabs start drifting after heavy rain, especially in one or two years of usage. Grid for Garden Path and Parking will prevent this destruction. Depending on the load intensity one of the following types of construction shall be chosen. For the building of a garden path it is recommended to use type A (the thickness of the resulting construction is from 15 to 30 cm). For the arrangement of private parking zone we advise you to use type B (the thickness of the resulting construction is from 30 to 50 cm). As a covering material one can use paving slabs, brick, crushed rock, bark chip or gravel. Crushed stone doesn’t go down during the usage of the path. The reinforced base ensures the stability of paving slabs. 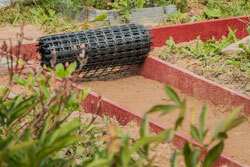 Thanks to the PROTECT Grid you can build durable paths and recreational areas in your garden! It will help in construction of a private parking lot or a driveway in front of your house. In both applications the reinforced base contributes to the even load distribution, therefore protecting the surface from deformation. Paved paths and areas would serve longer, which would result in easier maintenance. Efficiency. Grid for Garden Path and Parking is a cheap material. 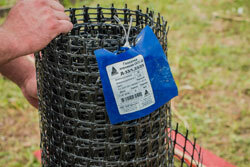 Priced affordably, the grid helps to reduce construction costs. Due to the fact that the draining layer of crushed stone is kept from scattering and sinking into the ground, there is 40% reduction of bulk materials consumption. 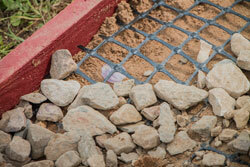 You will need less crushed stone and save your money! Effectiveness. 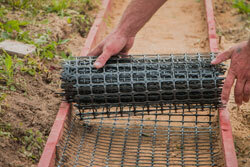 The grid improves wear resistance, as it reinforces the base of the construction. Its structureexcludes instability and subsidence of crushed stone. Grid for Garden Path and Parking allows you to prolong operational life of garden paths and recreational areas, i.e. to prolong the time of their effective usage before repair. Usability. Grid for Garden Path and Parking is characterized as a completely consumer-friendly product: with the size of 40 sq. m, it is affordably priced. One roll of the grid is quite sufficient for building 25 meters of garden paths or constructing a private parking lot for two cars.